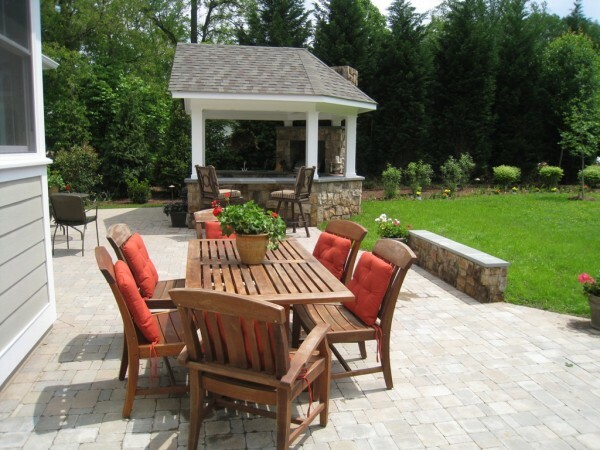 This outdoor living space in North Arlington, Virginia was designed and built with entertaining specifically in mind. 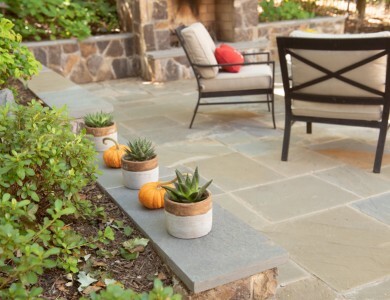 While we landscaped the entire property in attempt to promote privacy and seasonal interest, the focal point was really the patio design which featured a built-in hot tub and kitchen area to encourage outdoor entertaining. 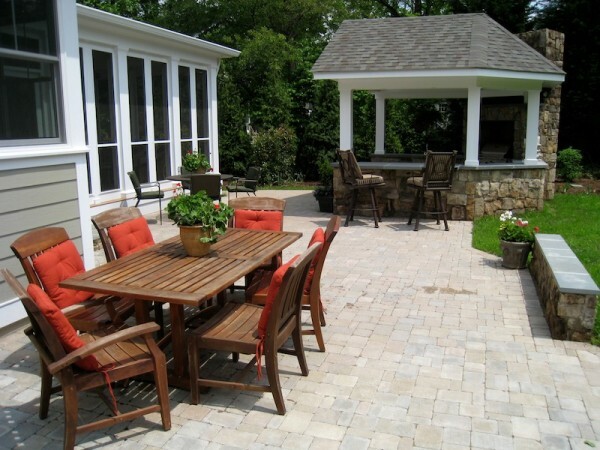 As the focal point for outdoor entertaining, we created a large patio design to accommodate multiple tables and bordered it with two seating walls. 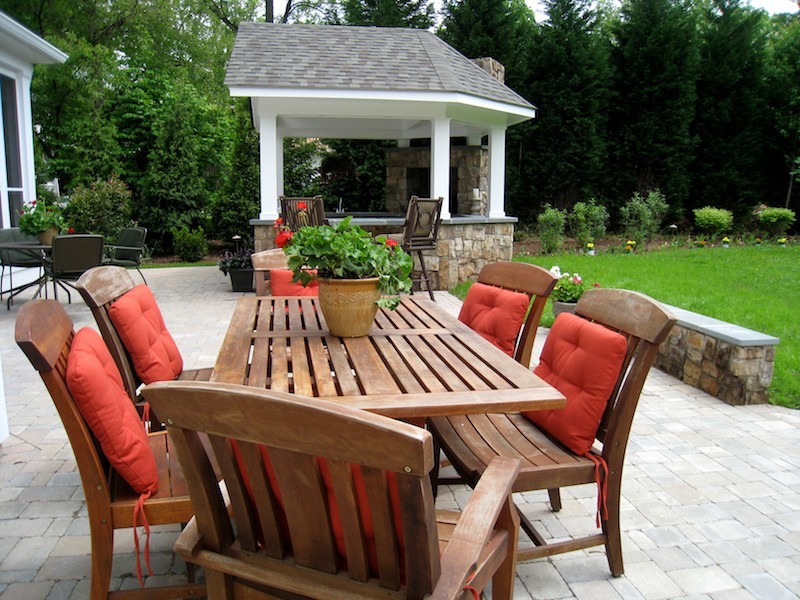 This allows for additional seating space and creates a feeling of coziness in an otherwise open area. 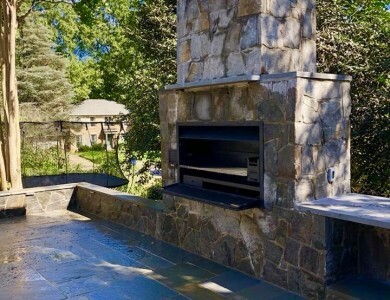 We used a Belgard paver called Dublin Cobble to build the patio, primarily because of the way its earth tones complement those of the Shenandoah Building stone in the outdoor kitchen and the seating walls. The walls were also capped with 1.5 inches of thick thermal Pennsylvania Flagstone. 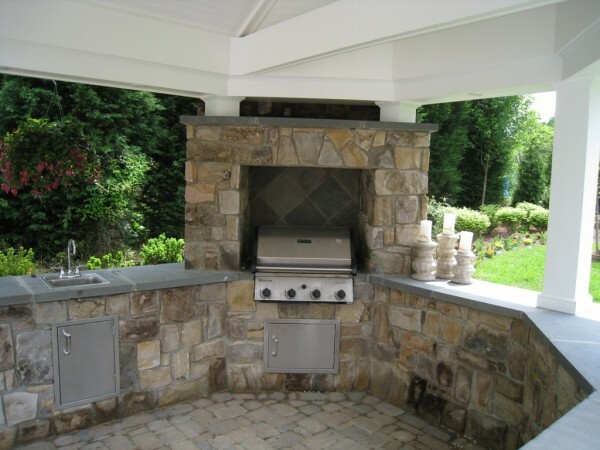 The outdoor kitchen was also created with outdoor entertaining in mind. 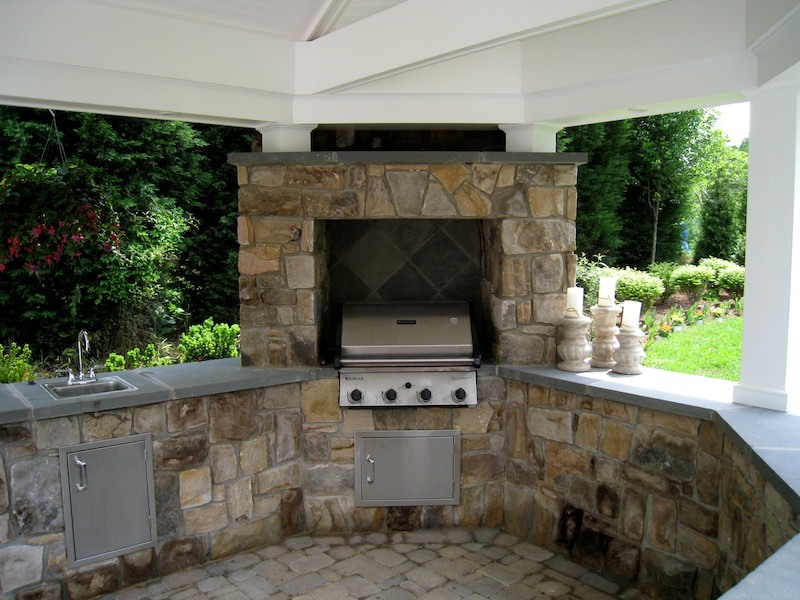 It primarily features a built-in gas grill with a large fieldstone fireplace, as well as a bar sink to make outdoor cooking that much more convenient. 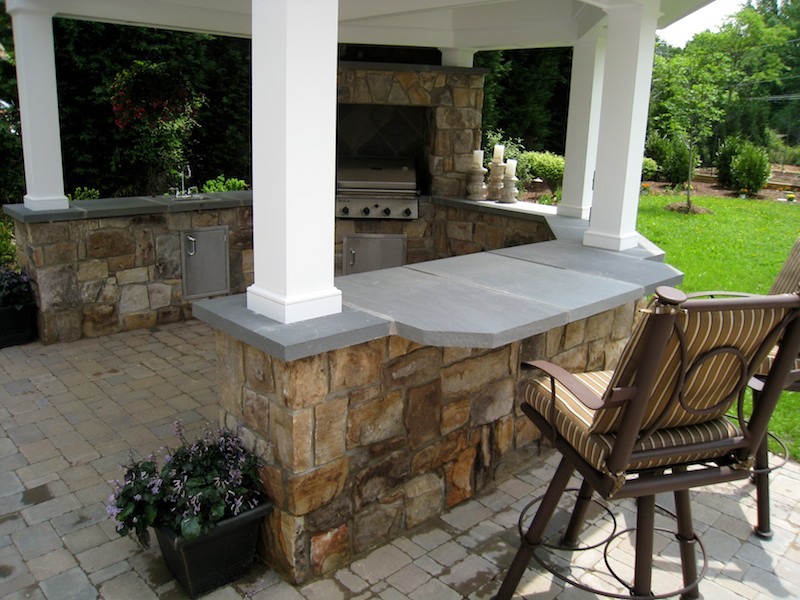 There is also a countertop area with bar stool seating so that guests and the cook can enjoy the same space. 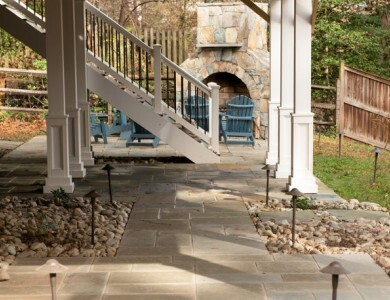 To construct the walls around the kitchen, we used the Shenandoah Building stone mentioned above, while Pennsylvania flagstone was used for the countertops within the pavilion. 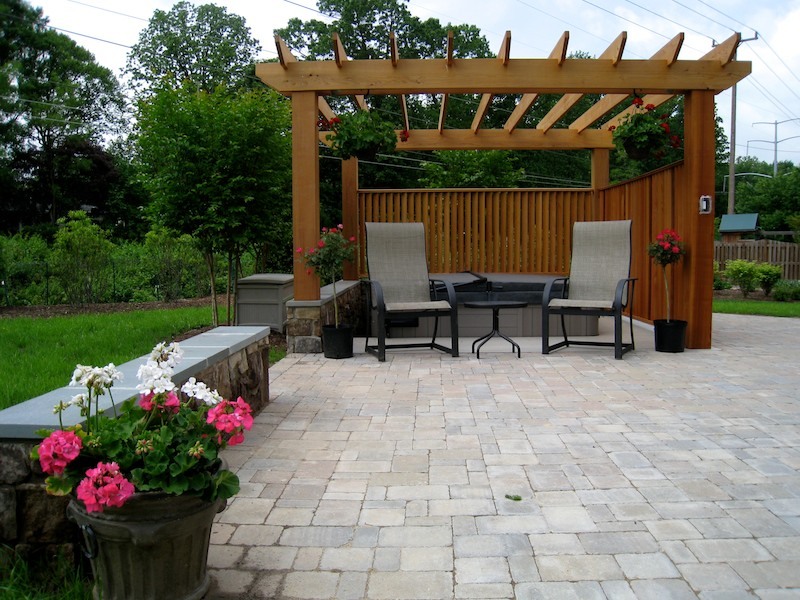 Finally, you’ll notice that the patio design features a built-in hot tub area framed by stone walls and covered with a cedar arbor. 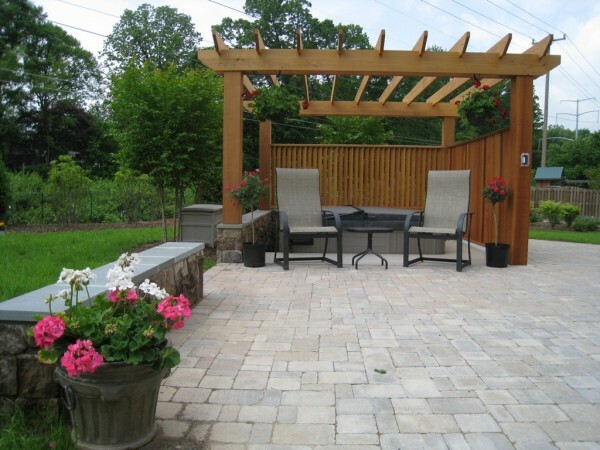 We chose the cedar for its warm colors, which perfectly complement the colors in the patio and walls, as well as its naturally rot-resistant qualities and extremely long lifespan. 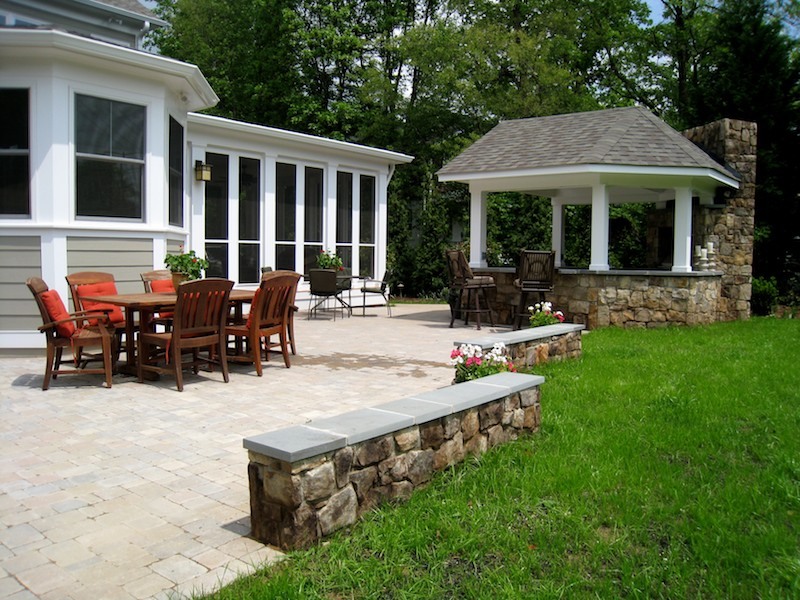 Like the seating walls, the walls surrounding the hot tub have caps made of thick thermal Pennsylvania Flagstone. 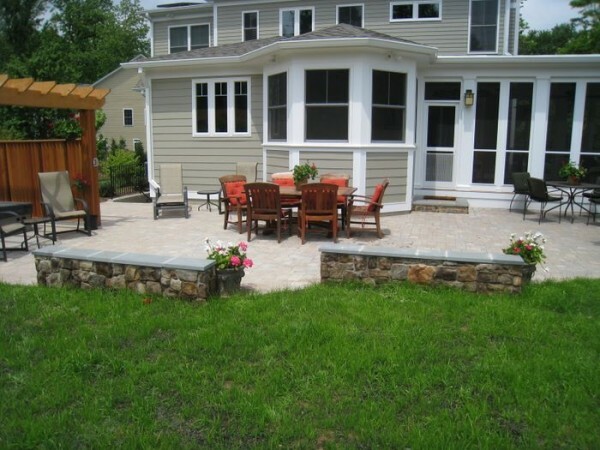 This patio design project in North Arlington is a great example of how you can expand your living space to create the perfect landscape for outdoor entertaining. 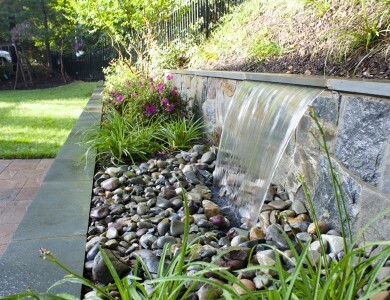 Are you looking to create a new landscape design in Northern Virginia? 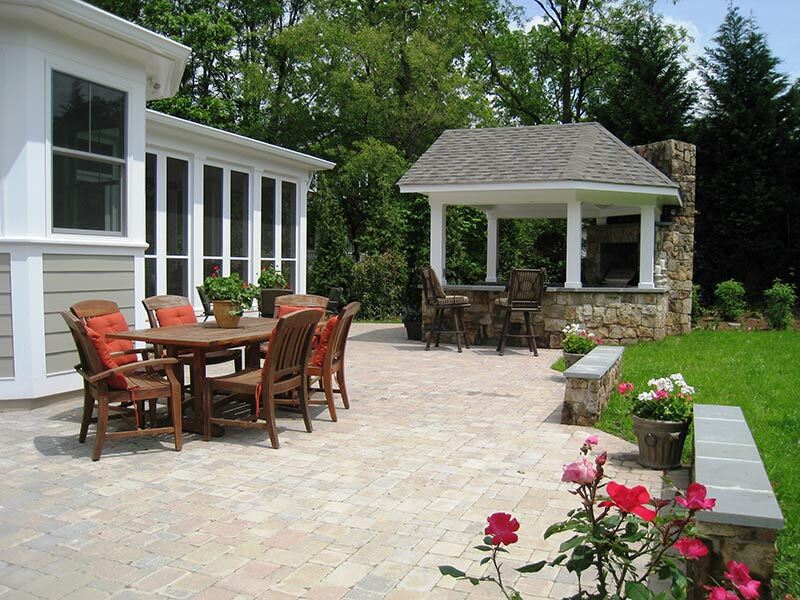 Whether you want to use this North Arlington patio design for inspiration or have other ideas of your own, O’Grady’s Landscape can help you create the perfect space for outdoor entertaining at home. Don’t wait to make the most of your backyard landscape—call us at 703-533-5001 to schedule a consultation today!